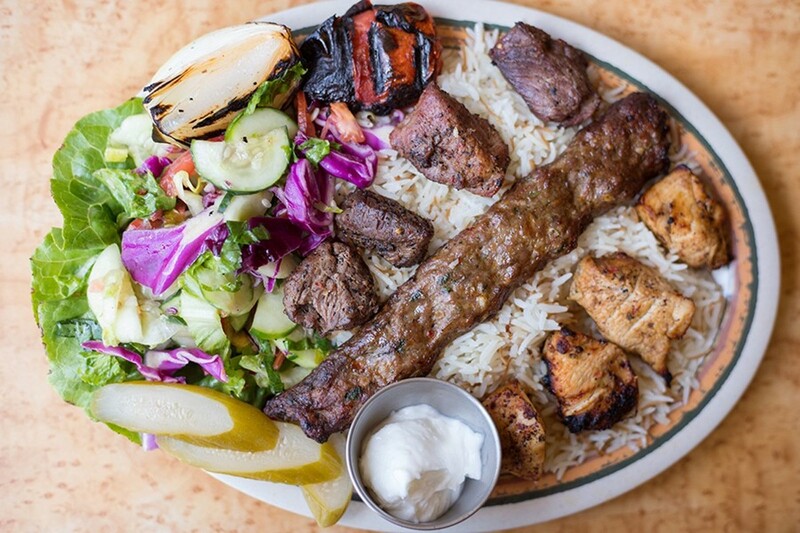 Majeed's mixed-grill entree includes beef kefta, shish tawuk and shish kabob, along with rice and salad. 4658 Gravois Avenue, 314-282-0981; Mon.-Sun. 11 a.m.-10 p.m. The bombing of the school is what did it for Mamdouh Majeed. His small town, Hama, hadn't exactly been safe since the first rumblings of the Syrian civil war began around 2009. It's why he had sent his wife and youngest son to live in Turkey. However, he and his elder sons had made the decision to stay behind in their hometown, opting to maintain the land, business and extended family ties that provided them with a good, middle-class life. Surely, better days would come. That calculus changed on the evening of Eid al-Adha in 2011. Majeed and his sons had gathered to celebrate the holiday when they heard the explosion. The school nearby was leveled, shaking not only their house but also their confidence in the idea that things would get better. Though it pained them to their very core, the Majeeds decided that staying in Hama was no longer an option. They left everything behind and fled to Turkey. Reunited with their matriarch and youngest sibling, the Majeeds began to create a new life in Turkey. Though language and cultural barriers made that difficult, they felt that they were beginning to rebuild and achieve some stability. 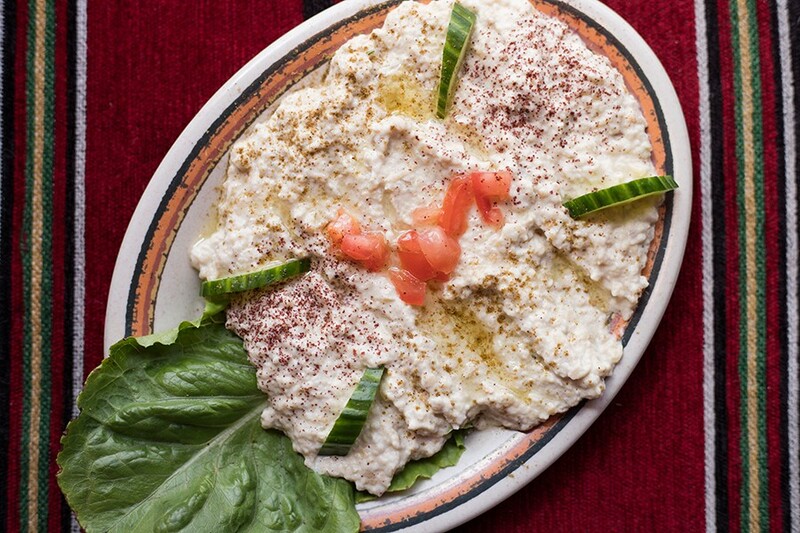 In Majeed's baba ganoush, the smoked eggplant is blended, but not pureed. However, at the urging of an international refugee nonprofit in Turkey, the elder Majeed was persuaded to apply for refugee status in the United States. He was hesitant at first but eventually saw the opportunity such an arrangement could provide. He applied, was approved, and before he knew it, the family was landing at O'Hare in a country they had only seen in photos. Chicago was a one-day stopover for the Majeeds before they were informed they would be placed permanently in St. Louis. With the help of the International Institute, they got a place to live and a crash course in American culture. It was difficult. They did not speak English, had no car and lacked the support structure they'd had back home. Still, they persisted, taking on odd jobs at Middle Eastern markets, grocery stores and restaurants around town to get on their feet. 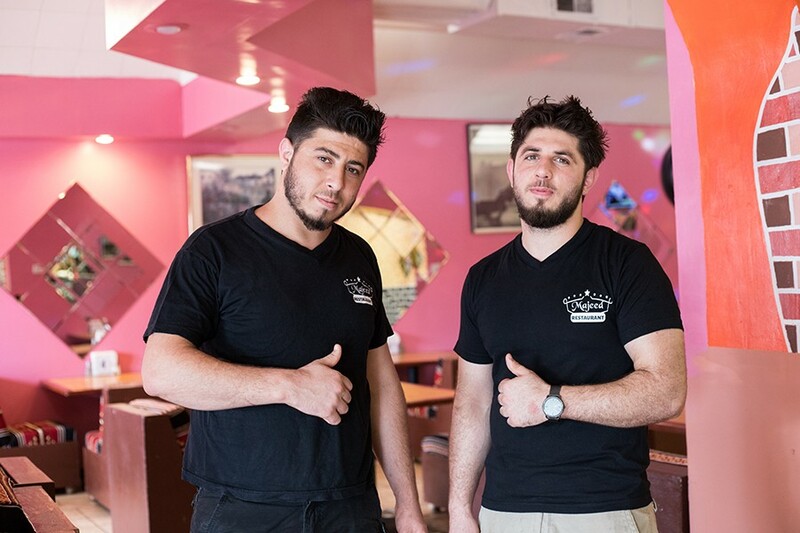 Back in Syria, the Majeeds had two businesses of their own — a construction design company, where Mamdouh Majeed made a name for himself doing stonework that made new buildings look historic, and a restaurant. Determined to reclaim some of their identity and strike out on their own in their new home, his sons decided to follow in their father's entrepreneurial footsteps. 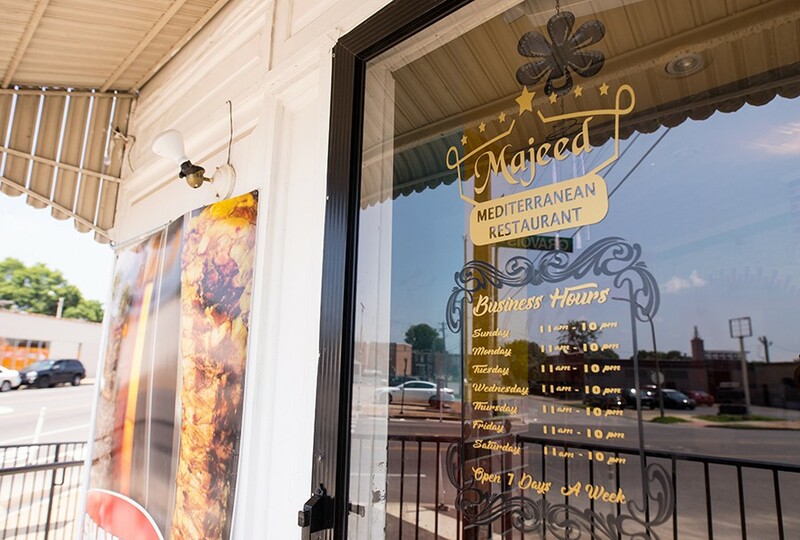 In that spirit, Majeed Mediterranean Restaurant was born. Majeed opened this past January in Bevo Mill, a neighborhood with a history of welcoming refugees. Prior to its current incarnation, the building housed Papagayos, a Honduran restaurant that relocated to Northampton in 2016. With Mahdouh Majeed's health not the greatest, his eldest son, Abdullhak, has taken the lead on the restaurant, serving as owner and co-chef. Together with his younger brother Ibrahim, Abdullhak has transformed the Central American-inflected space with Middle Eastern décor, like low-lying banquettes covered in traditional tapestries and Syrian serving vessels. Photos of Middle Eastern locations, including Turkey's Blue Mosque, hang from the salmon pink walls, and contemporary Arabic-language music videos fill the room with the same sounds that would have filled the Majeeds' family restaurant in Hama. Brothers Abdulhak and Ibrahim Majeed. Music is not the only thing that connects Majeed to the family's eatery in the old country. 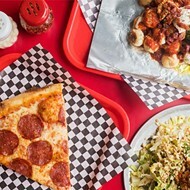 The restaurant serves a nearly identical menu of Syrian specialties, such as beef fatayer, a half-moon-shaped pastry filled with ground meat that perfumes the air with white onions and spices when pierced. The flaky, samosa-like shell soaks up the rendered beef jus, making an additional sauce unnecessary. Grape leaves, rolled with a mixture of ground lamb, beef and rice, are at once rich and bright. Unlike other versions of the dish, the stuffing here is the main flavor; the grape-leaf wrapper is but a tart accent. Baba ganoush is another example of a ubiquitous Middle Eastern dish that is elevated at Majeed. The smoked eggplant is blended, but not pureed, for a pleasantly rustic texture, and a liberal squeeze of fresh lemon cuts through the garlic and earthiness of the vegetables. It's positively luxurious. Hummus matches the baba ganoush's decadence. Though the dip is merely a blend of chick peas, tahini and olive oil, Majeed's take on the staple Middle Eastern dip has a perfect ratio, transforming these humble ingredients into a sumptuous, velvety concoction. It's the best version in town. 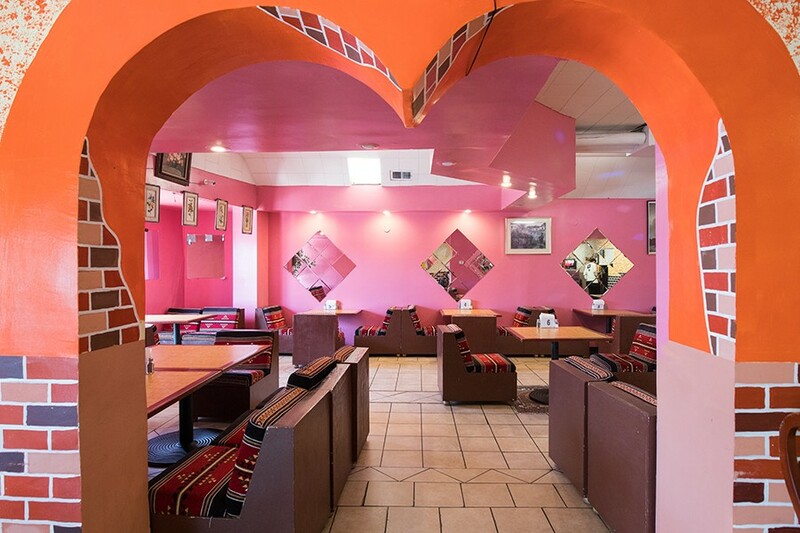 Previously Papagayo's, the dining room now features a host of Middle Eastern accents. Majeed's chicken shawarma also excels. 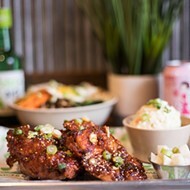 Somehow, each individual hunk of chicken is both succulent and caramelized on the outside. Lemon zest and garlic enliven meat that would be delicious even on its own. 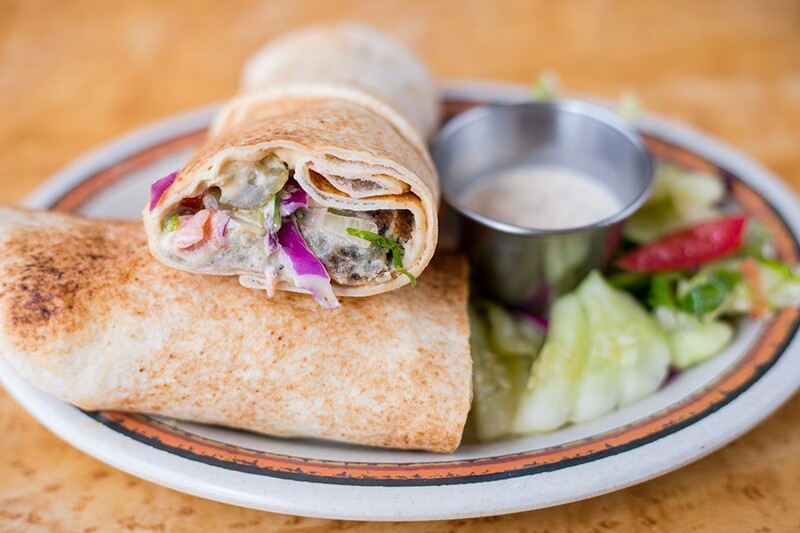 Slathered with a cloud-like garlic puree and wrapped into a pita, it's transcendent. Even a simple grilled-chicken kabob, the shish tawuk, is thrilling, its tender meat infused with herbs, garlic and lemon. The edges of the chicken are kissed with char, but the interior is as juicy as a braised piece of meat. The shish kefta is equally well executed. For this kabob, the poultry is ground and infused with black-pepper garlic and Middle Eastern spices. Beef kefta, so often a dried-out, lackluster kabob choice, is as juicy as a composite of slow-cooked pot roast. 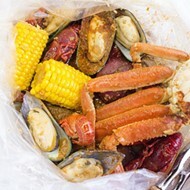 The meat pulls apart at only the slightest prodding; each bite is verdant with fresh parsley and garlic. Served over a platter, it is wonderful; wrapped in pita and covered in garlic sauce, it is sublime. The falafel sandwich is topped with onion, parsley, pickles and tahini. Majeed's falafel is my least favorite of its offerings. I prefer a style that has a more loose, grainy texture. This version is more of a deep-fried chickpea paste that is less seasoned than the restaurant's other offerings. The better vegetarian offering is the bitanjan, a sumptuous eggplant-and-tomato stew that evokes a Middle Eastern eggplant Parmesan. Ladled over rice, it's pure comfort. The stew is a window into Majeed's knack for slow-cooked dishes. A braised leg of lamb easily pulls off the bone and onto a bed of fragrant biryani rice. The meat's cooking liquid acts as a jus that soaks into the rice like a rich lamb stew. The highlight, however, is the Syria chicken, a leg and thigh quarter that is seared to crisp the outside skin, then slow-cooked with potatoes, olive oil and spices. The fat from the chicken forms a deep, schmaltzy gravy that caramelizes like brown butter. It soaks into the softened potato slices, giving the same rich effect you get from cooking potatoes in duck fat. I don't know what is more impressive: the superb execution or the price. 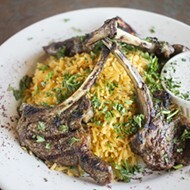 Majeed's menu is shockingly inexpensive, and this dish is a steal at just $9.99. Desserts include qatif with syrup and pistachios and baklava with pistachios and rosewater syrup. Ibrahim proudly says that people tell him the food reminds them of their mothers' home cooking. 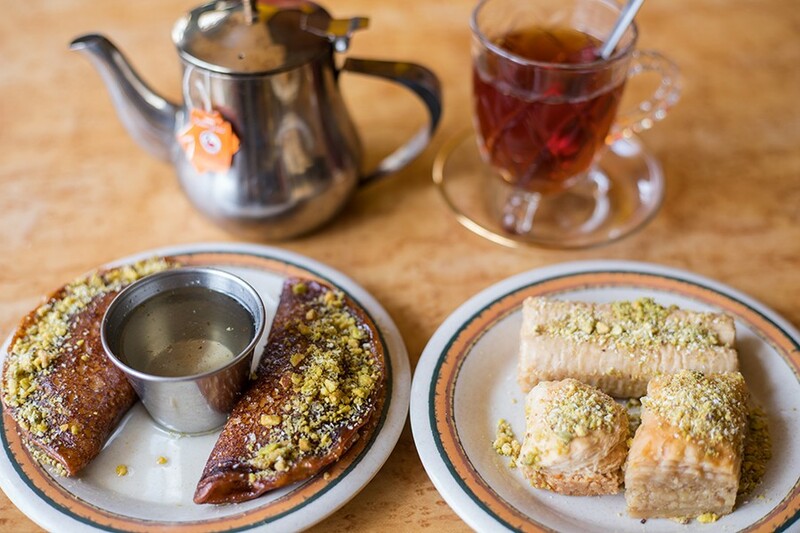 He also emphasizes that Majeed is the only restaurant in town to serve traditional Syrian desserts, including hiawat jibn, a cheese-filled sticky-dough pastry coated in crushed pistachios and scented with rosewater. The quatif is my favorite: a fried, nut-filled dough that's like a cross between baklava and a quintessential German apple strudel. Perhaps the Bevo Mill's towering presence just a block down Gravois is what brings to mind apple strudel. And the dessert also seems not all that different from the baklava-like flaky pita at J's Pitaria, the Bosnian shop just around the corner. On this Fourth of July, I can't help but think about these connections — how each generation has welcomed a wave of immigrants who left behind their homelands to create new lives in this little slice of south city. That they have been able to do that, and have made our lives more delicious in the process, is what makes America so wonderful. Scratch that. It's what makes America great. 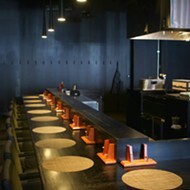 Majeed is located in Bevo Mill.